A team from Sylvester Comprehensive Cancer Center’s Clinical Research Services (CRS) and Sylvester administration recently shared their best practices and key insights with leading academic medical centers across the nation. Overall, the Sylvester professionals showcased 10 posters at the Association of American Cancer Institutes (AACI) annual Clinical Research Initiative (CRI) conference in Chicago. Sylvester displayed more posters than any other cancer center. Lauren Gjolaj and Avantika Dang with their poster, which won third place. 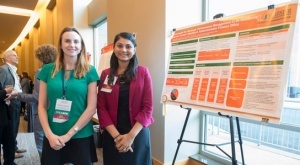 A poster presented by Lauren Gjolaj, M.B.A., B.S.N., R.N., director of clinical operations, and Avantika Dang, MHA, director of business operations, placed third of 68 submissions. Their poster on “Framework for Strategic Performance Management in an Academic Cancer Center’s Research Administration Finance Office” included contributions from Yunie Castillo, M.P.H., and Jorge Contreras, M.B.A.
She added that the conference provided a collegial environment to learn from other institutions, such as best practices for implementing clinical research at satellite facilities. The Association of American Cancer Institutes comprises 98 leading cancer research centers in North America. AACI’s membership roster includes National Cancer Institute-designated centers and academic-based cancer research programs that receive NCI support.